Oxford Street is possibly one of the most underappreciated streets in London. It is undergoing a marvellous renaissance. In a single brief visit last week, I was able to find streetscape art, architectural art and gallery art all flourishing off north Oxford Street in the area opposite Bond Street Tube. The tiny Bird Street runs from Oxford Street to Barrett Street just behind. Smooth as a billiard table artificial grass has been laid - making the little street feel like a breath of the countryside, even in the rain. A row of beach cabins have been installed (see left) and you can have your picture taken and instantly uploaded to your device. Walk to the end of Bird Street from Oxford Street and turn right into Barrett Street. Be careful crossing James Street and continue along the southside of the quiet pedestrianised enclave that leads to St Christopher's Place. There at the top you will find Jigsaw - in a sleek and modern building that somehow blends perfectly with its older neighbours. On the far left you will find my third surprise, the Tyburn Gallery. The Tyburn Gallery is well named for the river of that name (now underground confined in a pipe) crosses Oxford Street at this point on its way down to the Thames. The gallery is showing Untitled, a group show of the work of five artists. 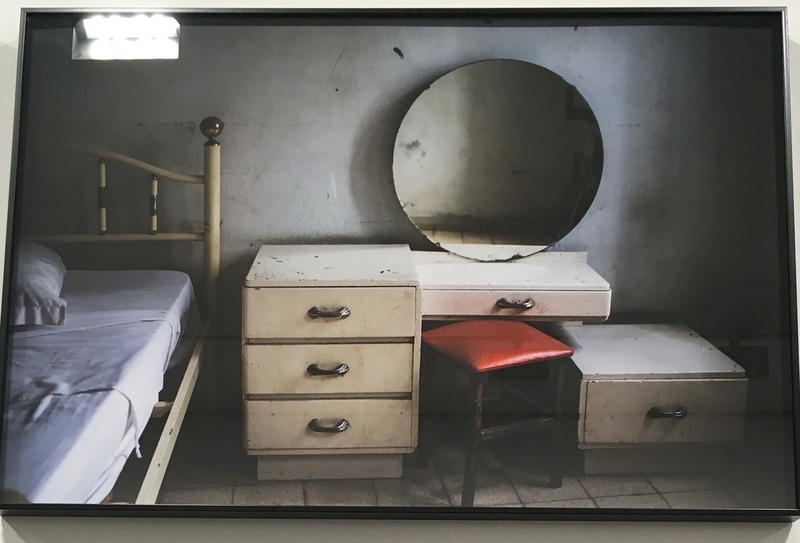 Left is 'Hotel Globo' (2016) by Mónica de Miranda, one of a series of 10 shot in an Angolan Hotel unchanged since the 1950s. Joël Andrianomearisoa (his 'Passion labyrinth' from 2014 works with flat and folded black paper on a white ground, full of subtle interaction from every angle. It reads, to me, like a wonderful 3D (and rectangular) evocation of Kazimir Malevich's 'Black Square' (Malevich's memorable exhibition at Tate Modern was covered in this blog in August 2014). Three further artists complete the lineup. Victor Ehikhamenor shows large works of intricately perforated white paper. Edson Chagas shows us Luanda City in a series depicting 'everyday objects'. Some of the urban walls of Sfax in Tunisia form the basis for the work of Mouna Karray. Enjoy it all: the art; the architecture and design; the light, the peace, the super clean sparkle, the unhurried atmosphere - with little or no motorised traffic, you'll feel welcome here.